A lesson I’ve learned over the past four years building and growing the team at Buffer is how important awareness is to self-improvement. I’m starting to think awareness is the tough part. Most of the battle for learning, growing and improving is being aware of what to improve. When I joined Buffer, I was surrounded by a team that values self-improvement and communicating with clarity. Since we’re a remote team of 80 people across the world, how we come across in written communication is utterly important — especially knowing that there are cultural differences in communication (and knowing that many team members have learned English as a second language). As a result you’ll rarely see sarcasm or ambiguity in our communication, and this is something the entire team helps each other out with to improve on. Had I not joined Buffer, I probably wouldn’t have recognized how fully important this is — my awareness on communication expanded because of what’s valued by the team members I’m surrounded by at Buffer. I’m grateful for this. This email was featured on Fast Company and afterwards Tracy Chou sent a tweet that opened my eyes to the incredible inconsistency in my approach. Thanks to Tracy for mentioning this, increasing my awareness of how what I say and do can be perceived. Just as I’ve developed an awareness of how important it is to be clear and remove ambiguity in communication among my team-mates, this was a moment further expanding my awareness on communication. While it seems obvious to me now, however I never fully thought about how I worded emails and how my approach could be perceived in terms of inclusivity. Hey Dude/Man! → Hey hey <name>! I still slip up quite a bit with my wording — especially in ad-hoc verbal communication. It’s one I’m seeking to improve on, and if I slip up, I try to recognize it in the moment as I know simply being aware of it is the hard part. With this, I’m looking for further ways to be able to connect with others in a deep way. It’s the reason why I’ve started to say ‘Hey hey’ as it lets me still connect in a friendly and inclusive way. It allows me to connect in a similar way to what I was trying to achieve when I’d say ‘Hey Dude!’. I definitely recognize I’m only at the beginning of this journey, though I’m determined to expand how I communicate with a lens to hopefully filter out potential biases. I don’t know if I would have ever actively focused on my language with respect to inclusivity without feedback from Tracy or the support from some amazing team-members. Feedback like this, which triggers more awareness is so key to self-improvement. And as a leader, it’s likely your actions will be interpreted and perceived in many different ways, often beyond the scope of one’s own awareness. That’s why it’s important for any leader to be self-aware and seek out opportunities to expand that awareness. This is a key reason why building a diverse team from as many backgrounds as possible is important. A diverse team that is comfortable with providing honest feedback will naturally have many more opportunities to increase awareness — which in turn improves the team and individuals. While I’ve been striving to improve my language (among many other things), I know this is a life-long journey. Feedback to increase awareness in how my actions and what I say is perceived is so valuable, and I hope everyone has a safe space to provide that feedback back to me. I’d love to know how this post is perceived to you. Do you have other examples of how an increased awareness helped you to improve? We’d love to hear your thoughts in the comments! 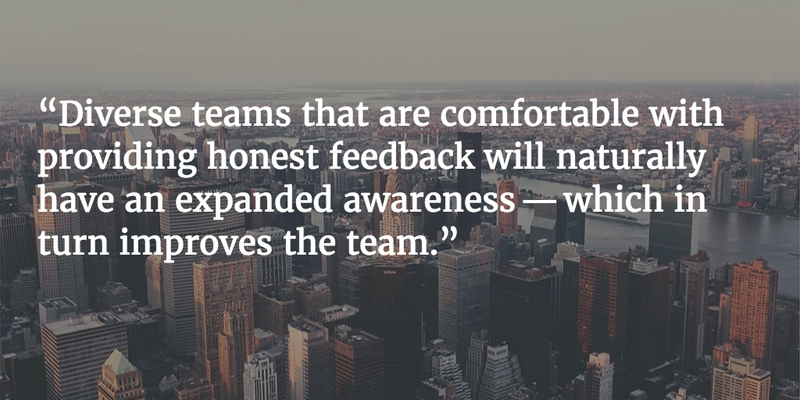 I am honored to be working in a team that values feedback too and take action on the feedback.